Discovery is a very important activity as a child, and capturing the moment by hiring a Gulf Shores family photographer is a must. The more a child discovers, the more their mind develops. We must immerse our children in all sorts of activities. The more the better. It is a very crucial step in proper early childhood development. When we immerse our children in activities that are out of the norm, they are able to adapt and evolve in ways that others might not. When you add super stimulants like the beach, you not only get a family vacation, you open a child's eyes to another world of opportunity. Take for instance our little princess from last night's sunset session. 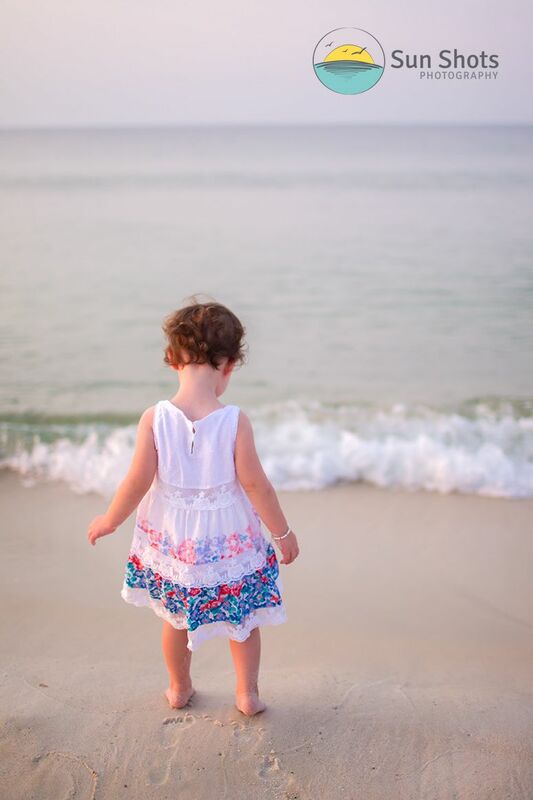 Her discovery of the beach might just lead to her becoming a marine biologist in the future. She might be the scientist that saves the planet from global warming by discovering an algae than eats carbon dioxide. Who knows, this families vacation might be that first step that saves the world in the future. You just never know. Her discovery of the beach can lead to many many doors opening in the future. Sure some might say its just a vacation, but we think it is an opportunity to discover who we really are. If your kids are in the normal summer hustle and bustle, and you think a little discover might be in order as well, please give us a call to find out more. We can not only hook you up with the best places to stay while on vacation, we can share all our information about our family portrait photography sessions. We want to be your Gulf Shores family photographer. We promise to help you create some unbelievable family beach art, and hopefully help open your child's eyes to a little beach discovery as well. There is still plenty of time to squeeze in a little family beach vacation before school kicks back in, so call us today and pack the kids in the car and head on down for the weekend.